Mike's triathlon journey: Eight for eight! I hardly ever get all eight of my work outs in during the week but managed it this week. It's a big accomplishment for me since it included two 5:30 am workouts so I have to brag. I had four things I wanted to get done this weekend, two chores and two workouts. Well, caulking the bath tubs and trimming the bushes will have to wait. Hopefully I can fit them in next weekend. Oh well. I've been thinking about eating more than training lately so I'll share a couple quick, simple recipes. 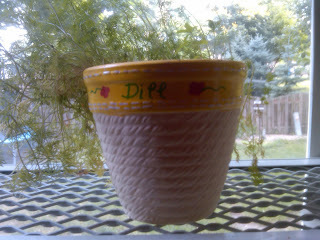 My wife knows I love to cook so she planted some herbs in hour kitchen window box. 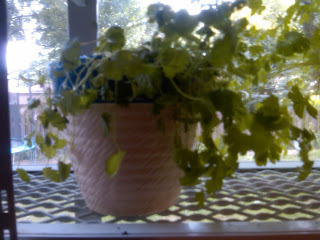 I now have fresh cilantro, basil, parsley, and dill. The cats knocked over the oregano several times, so it didn't make it. So Saturday, one thing I used the fresh cilantro for was a Mahi Mahi steak. I forgot to take a picture but the recipe was simple. Juice from two limes, equal amount of olive oil, and minced cilantro. Coat fish with mixture then grill 3-7 minutes per side until the fish is flaky. I'll repeat this when I remember the camera (blogger failure :-)). 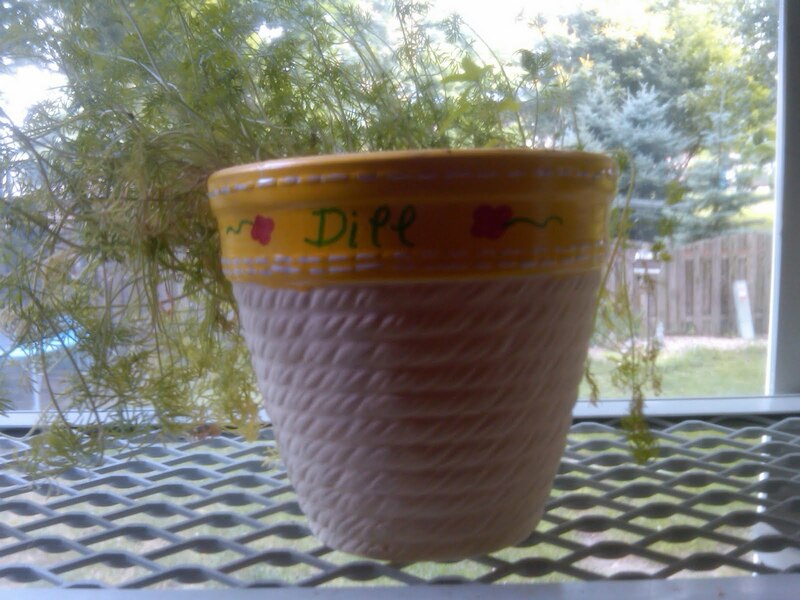 Sunday I used the fresh dill for some cucumber salad (actually Cheryl made it, I was the helper). Take a couple cucumbers, skin them then cut them in to slices. 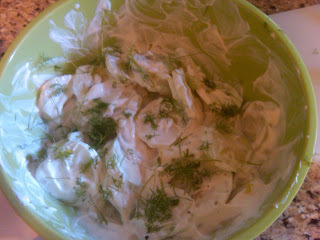 Add some light sour cream, a pinch of salt and pepper, a cap full or two of vinegar then dill to taste. I also love the cheap fresh berries you can get this time of year. 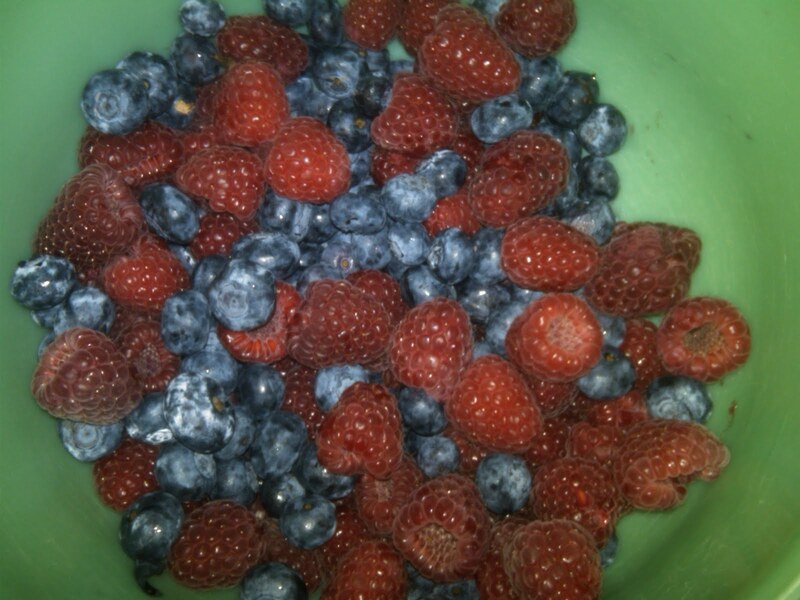 Take some blueberries and raspberries, mix them together and you have a healthy, delicious side dish in seconds! I tried adding whipped cream on top for a better presentation, but it started melting almost immediately, fail! One more recipe while I'm thinking about it. My dad sent me a link for a jalapeno popper recipe a while back and I've made it a few times with great results. I shared the link with a couple friends this week and was looking forward to making a few this weekend. I arrived in the produce section in the store to this. If you have access to jalapeno pepper this time of year, and you like bacon, this is for you. Great job getting in all your workouts. That's a huge accomplishment, especially when you're working full time too. Yay for getting your workouts done! Did the cats knock over the oregano so they could nibble on it?? 5:30 workouts are a killer! Way to go!!!! Good job getting all your early morning workouts in!! Gosh, I wish I could hire someone around our house that is inspired by food and recipes....because I am SO not but I love to eat good stuff! Yay for a great training week!!! I'm not a fan of bacon but berries and cilantro are my favies. Great training week for sure. I am so spoiled being off work for the summer, I dread going back to those 5am workouts once school starts back up. 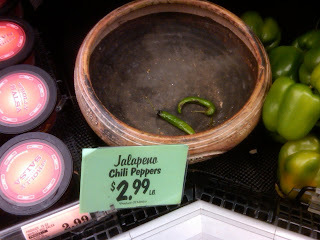 Buy your peppers before you share the link - lol! It's better to watch a field of 190 plus riders in the middle of burning +/- 5000 calories for the day while you are stuffing your face with fruit and not ice cream.